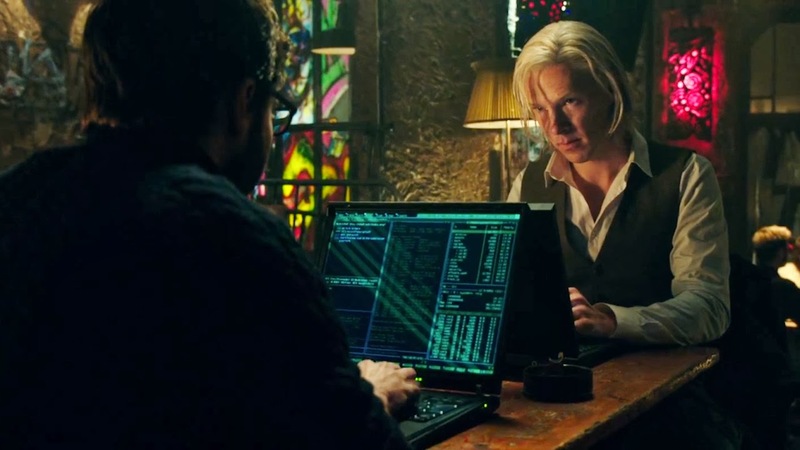 A biographical technology drama, The Fifth Estate delves into the chaotic formative years of WikiLeaks and the profound questions caused by the sudden public availability of state secrets. The film briefly starts in 2010, with The Guardian, The New York Times and Der Spiegel about to co-publish The Afghan War Logs, derived from thousands of United States secret government cables leaked to WikiLeaks by Bradley Manning. The story then shifts back to 2008, when German tech whiz Daniel Domscheit-Berg (Daniel Brühl) meets and agrees to help WikiLeaks founder Julian Assange (Benedict Cumberbatch). Assange is passionate about providing an unfiltered anonymous platform for whistleblowers to reveal hidden corporate and government information. The popularity of WikiLeaks grows with revelations about tax evasion on a grand scale at a Swiss Bank. Daniel is captivated by Julian, who is enigmatic but also obsessed with his own version of the truth and not beyond twisting facts for his benefit. The worldwide scoops multiply, and WikiLeaks becomes a thorn in the US government's side. Daniel's relationship with girlfriend Anke (Alicia Vikander) suffers, and more tension lies ahead as Assange seems oblivious to the individual harm that could be caused by the release of unredacted data. Directed by Bill Condon, The Fifth Estate is only a few years removed from the events depicted. Both a biography of Assange and a commentary on the rapidly shifting world of no secrets, the film is always dynamic, sometimes frantic, and often resembles the chaotic no-one-is-in-control reality of information in the citizen journalist world. The Fifth Estate is based on two 2011 books: Inside WikiLeaks: My Time with Julian Assange at the World's Most Dangerous Website by Domscheit-Berg, and WikiLeaks: Inside Julian Assange's War on Secrecy by David Leigh and Luke Harding. And this is not a hero-worship story: the film presents Assange as a deeply flawed man living in his own world, charismatic enough to dominate a room and attract ardent followers but also blinkered in pursuing a self-defined mission. It's an attractive proposition for a biography to pursue, and allows screenwriter Josh Singer to chase the various shades of grey morality in the WikiLeaks story. Aware that the film is treating history too close to the source, Condon expands the breadth and triangulates numerous issues, rather than diving too deeply into any one aspect. The Fifth Estate takes pains to cover the people, the technology, the profession of journalism, the actual historical events, and the implications both intended and not, and never dwells for too long in one place. There is something here from every angle, and while none of it is perfect or fully satisfying, it is all rich fodder for thoughtful discussion. Through the sub-story of a trio of State Department and White House officials (played by Laura Linney, Stanley Tucci and Anthony Mackie) struggling to cope with the sensitive state secrets suddenly detonating on WikiLeaks, Condon takes a stab at reflecting the information age's unexpected consequences. He also throws in a sub-sub-story of an American informant in the Libyan government, whose identity is potentially exposed in the leaks. Elsewhere traditional journalists at The Guardian, already struggling with the digital revolution, now have to contend with defending their professional standards as a tsunami of astounding information is about to be unleashed on an unsuspecting world in unfiltered format. Are the rules being rewritten, or is this the reason the tried and tested rules exist in the first place? Benedict Cumberbatch delivers a chilling performance as Assange, self-assured, emotionally domineering and steely-eyed, his shock of white hair working to his advantage. Daniel Brühl gets plenty of screen time, and the film is as much the Domscheit-Berg story as it is about Assange, and this is not necessarily always a good thing. Alicia Vikander cannot do much with the role of the token girlfriend. The Fifth Estate doesn't contain any great revelations, yet it's a stylish point-in-time marker, a chronicle of an inflection point in privacy's death march. Governments are also losing the right to keep any secrets, and all it took was one determined man and one website to make it happen.